For the past six months I've been working on research and testing for the next major AnandTech SSD article. I figured I had enough time to line up its release with the first samples of the next-generation of high end SSDs. After all, it seems like everyone was taking longer than expected to bring out their next-generation controllers. I should've known better. 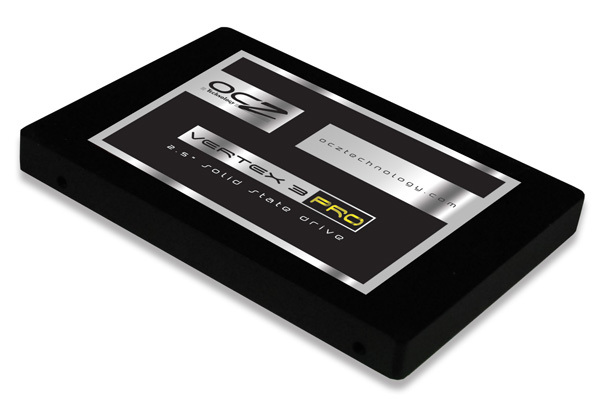 At CES this year we had functional next-generation SSDs based on Marvell and SandForce controllers. The latter was actually performing pretty close to expectations from final hardware. Although I was told that drives wouldn't be shipping until mid-Q2, it was clear that preview hardware was imminent. It was the timing that I couldn't predict. Two days isn't a lot of time to test an SSD. It's enough to get a good idea of overall performance, but not enough to find bugs and truly investigate behavior. Thankfully the final release of the drive is still at least 1 - 2 months away, so this article can serve as a preview. 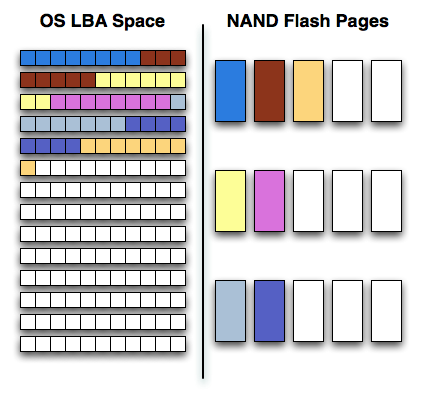 I've covered how NAND Flash works numerous times in the past, but I'll boil it all down to a few essentials. NAND Flash is non-volatile memory, you can write to it and it'll store a charge even if you remove power from the device. Erase the NAND too many times and it will stop being able to hold a charge. 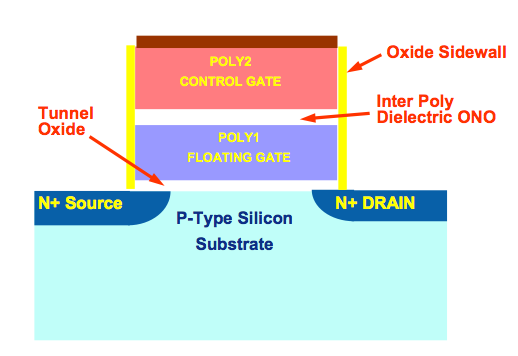 There are two types of NAND that we deal with: single-level cell (SLC) and multi-level cell (MLC). Both are physically the same, you just store more data in the latter which drives costs, performance and reliability down. Two-bit MLC is what's currently used in consumer SSDs, the 3-bit stuff you've seen announced is only suitable for USB sticks, SD cards and other similar media. Writes to NAND happen at the page level (4KB or 8KB depending on the type of NAND), however you can't erase a single page. You can only erase groups of pages at a time in a structure called a block (usually 128 or 256 pages). Each cell in NAND can only be erased a finite number of times so you want to avoid erasing as much as possible. The way you get around this is by keeping data in NAND as long as possible until you absolutely have to erase it to make room for new data. 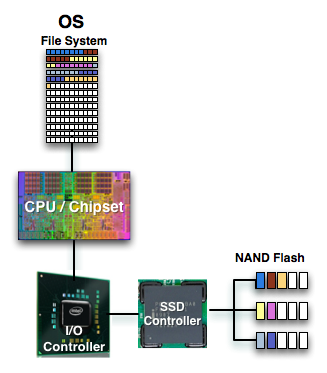 SSD controllers have to balance the need to optimize performance with the need to write evenly to all NAND pages. Conventional controllers do this by keeping very large tables that track all data being written to the drive and optimizes writes for performance and reliability. The controller will group small random writes together and attempt to turn them into large sequential writes that are easier to burst across all of the NAND devices. Smart controllers will even attempt to reorganize data while writing in order to keep performance high for future writes. All of this requires the controller to keep track of lots of data, which in turn requires the use of large caches and DRAMs to make accessing that data quick. All of this work is done to ensure that the controller only writes data it absolutely needs to write. SandForce's approach has the same end goal, but takes a very different path to get there. Rather than trying to figure out what to do with the influx of data, SandForce's approach simply writes less data to the NAND. Using realtime compression and data deduplication techniques, SandForce's controllers attempt to reduce the size of what the host is writing to the drive. The host still thinks all of its data is being written to the drive, but once the writes hit the controller, the controller attempts to reduce the data as much as possible. The compression/deduplication is done in realtime and what results is potentially awesome performance. Writing less data is certainly faster than writing everything. Similar technologies are employed by enterprise SAN solutions, but SandForce's algorithms are easily applicable to the consumer world. With the exception of large, highly compressed multimedia files (think videos, MP3s) most of what you write to your HDD/SSD is pretty easily compressible. You don't get any extra space with SandForce's approach, the drive still has to accommodate the same number of LBAs as it advertises to the OS. After all, you could write purely random data to the drive, in which case it'd behave like a normal SSD without any of its superpowers. Since the drive isn't storing your data bit for bit but rather storing hashes, it's easier for SandForce to do things like encrypt all of the writes to the NAND (which it does by default). By writing less, SandForce also avoids having to use a large external DRAM - its designs don't have any DRAM cache. 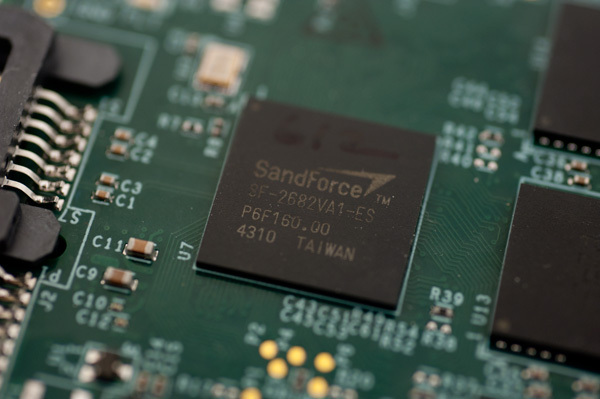 SandForce also claims to be able to use its write-less approach in order to use less reliable NAND, in order to ensure reliability the controller actually writes some amount of redundant data. Data is written across multiple NAND die in parallel along with additional parity data. The parity data occupies the space of a single NAND die. As a result, SandForce drives set aside more spare area than conventional controllers. 1) Toggle Mode & ONFI 2 NAND support. Higher bandwidth NAND interfaces mean we should see much better performance without any architectural changes. 2) To accommodate the higher bandwidth NAND SandForce increased the size of on-chip memories and buffers as well as doubled the number of NAND die that can be active at one time. Finally there's native 6Gbps support to remove any interface bottlenecks. Both 1 & 2 will manifest as much higher read/write speed. 3) Better encryption. 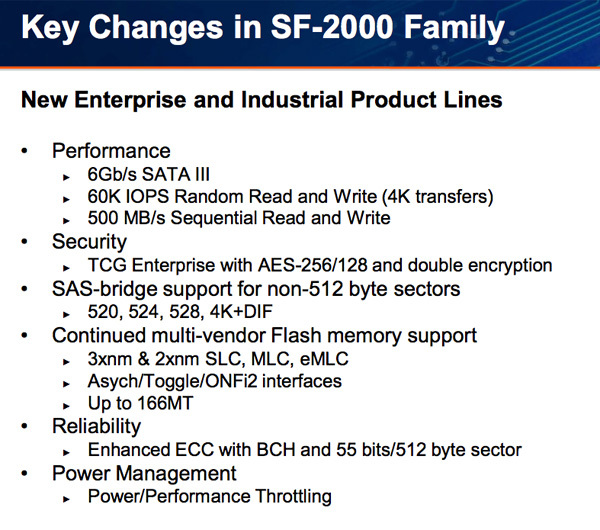 This is more of an enterprise feature but the SF-2000 controllers support AES-256 encryption across the drive (and double encryption to support different encryption keys for separate address ranges on the drive). 4) Better ECC. NAND densities and defect rates are going up, program/erase cycles are going down. The SF-2000 as a result has an improved ECC engine. All of the other features that were present in the SF-1200/1500 are present in the SF-2000 series. 'We're still a couple months away from knowing exactly what to buy, but if you've been putting off that move to an SSD - 2011 may be the year to finally pull the trigger"
Which one is XP compatible Out of the Box? I'd love to buy a Sata 3 SSD that can saturate my XP Sata 2 ports but should we stick with Older/Slower Intel Sata 2 SSD's for compatibility?????? I know everyone has their own reason for keeping XP... but if you want to buy a $200+ SSD how can you not pony up the 100 for windows 7? So lets just stick to the question I asked shall we? You forgot to mention how locking DX10 to Vista/7 was a deliberate ploy to force gameplayers to upgrade. And how Win7 is just Vista done right.